We are happy to assist you!! ​ All Kind Of Satellite Dish Antenna Installation / Programing / Renewal / Recharge. With great pleasure, we take this opportunity to introduce ourselves. We are providing services for Dish Installation In Buildings, Offices, Shops, etc and all kind of Channel Renewal or Recharge. Digital HD 3D AND Normal Receivers, FTA, Card Slot Models, Dish Antenna Fixing with Internal and External cabling. Digital HD LNB's, Dish Antenna's, Diseq's, Cable. NileSat, Hotbird, BadrSat, Arabsat, Yahsat 1A, Asiasat 3-5, IntelSat17, Astra, Atlantic Bird, Yamal, EutelSat W3-W6-W2A, Eutelsat 12A, EuroBird-EutelSat 9a, Eutelsat 16, PakSat 1r, IntelSat 902, ApStar, Express, ChinaSat, Es'hail etc..
Arabic, English, French, German, Turkish, Italian, Swiss, Brazilian, Croatian, Greek, Spanish, Hungarian, Portuguese, Sweden, Serbian, Russian, Balkans, Urdu, Hindi. 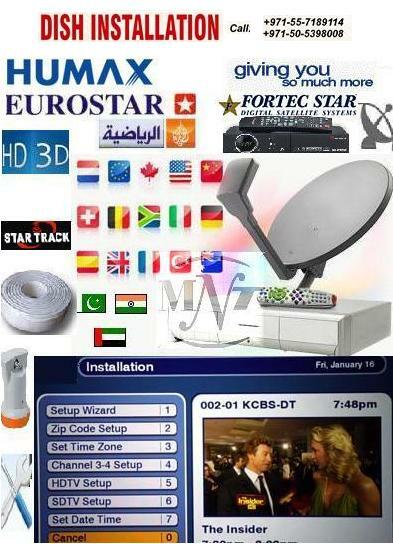 All Kind Of Satellite TV channel Installation. AFN Europe, Sky-Italia, Nova Greece, Canal+ And BIS HD-France, SRF Swiss, RTS Swiss, Sky-German, TV Globo-Brazil, Hello HD-Hungary, Total TV-Serbia, Digi-Turk, Kabelkiosk-German, NC+ And Cyfrowy Polsat-Poland, TivuSat-Italia etc. All Sports, Movies, Children's And HD Channels Installation With Warranty. Let's Place Your Order !! بسرور كبير، ونحن نغتنم هذه الفرصة لنقدم أنفسنا. نحن نقدم خدمات لتركيب الصحن في المباني، مكاتب، محلات، الخ، وجميع أنواع قناة تجديد أو إعادة شحن. Scan this QR code to place order right from your smart phone.